Cramer’s expertise lies within the cleaning, care and repair of sanitary surfaces. Their products are amazingly simple and safe to handle for the end user and a Cramer product delivers a perfect result, every time. Once a specialist for just ceramic and enamel surfaces, Cramer has since developed a highly specialised assortment of state-of-the-art care and repair products. They are a true global player, delivering products to customers in more than 30 countries. 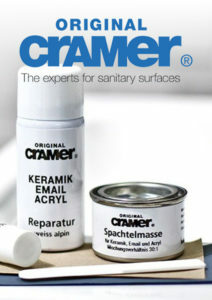 View and download our entire range of Cramer products. Alternatively, for ordering, questions or any further information please contact our Sales Team on 0208 984 1000.